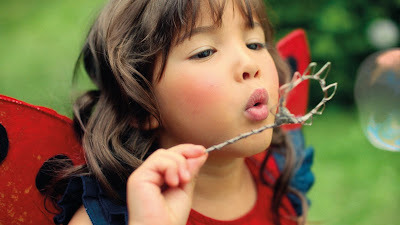 St Luke's Blog: Abra-abra cadabra - Littlewoods Kids goes live! If the enjoyment and success of filming our latest Littlewoods advert for their Ladybird children's range is anything to go by, then the oft-quoted phrase "never work with children or animals" is a load of old codswallop. We loved it. A cast of excitable, playful and very cute 4 to 7 year olds are the stars of our latest ad which launched on August 1st. It's a throwback to a traditional children’s party, primarily set in a beautiful garden - where computers, phones and gadgets are replaced by pass the parcel, blind mans buff and general frolicking and dancing. Unfortunately for our ears, they wanted to dance to Gangnam Style on repeat between takes. Director Karen Cunningham said “The idea was to create an old fashioned party… back to lovingly made jelly, and cupcakes and beautifully homemade birthday cake.” During the ad, a very cute "mini Myleene", played by Evie Lew-Davies, magically touches the other party guests making their outfits transform into a second stylish outfit from the Ladybird collection, showcasing their fantastic range. When all the work is done "mini Myleene" transforms into adult Myleene Klass to give the final Littlewoods touch. The soundtrack is the ridiculously catchy Abracadabra by Steve Miller Band, and the campaign will be supported by online, social media and print ads. We're excited to continue working with Littlewoods in their aim to become the biggest suppliers of quality children’s clothing in the UK. Ch-ch-check it out in the image above.